The piece had remained in the famed Borghese family collection in Rome for nearly 300 years before stints with French actress Cecile Sorel, who had used it to decorate a bathtub in her Paris townhouse, and former French prime minister Paul Reynaud. When he searched through the Louvre Museum’s database, Heintz traced the panel’s ownership back to Zola in a document dated 1903, one year after the author’s death. 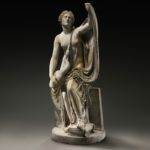 Other antiquities featured in the sale were a Roman bronze figure of Aphrodite that sold to a buyer for 530,500 dollars, and an Egyptian red granite head dated 1479-1450 BC that sold for 272,500 dollars. A second-century Roman marble head of Hermes, by Greek sculptor Lysippos, fetched 182,500 dollars.